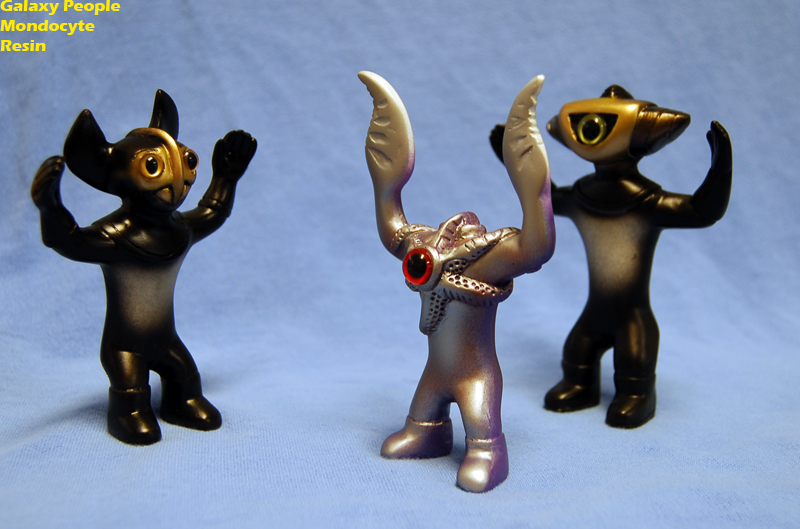 The Galaxy People are a new line of resin figures made by Skullbrain user Mondocoyote. The first wave, Incident on Asterius 19, was available on his web-store. Meklops and Chirops were the regular releases, in matching uniforms. Unfortunately they are now sold out, but since the first real release was such a success, we will undoubtedly be seeing more. The Galaxy People figures are hand-sculpted, cast in resin, and painted, and look awesome. They have a very clean finish, and a cool retro sci-fi vibe going on. The figures are all posed in the classic cheapie Japanese vinyl ‘flying pose’, and look ready for action. The resin has a great heft to it, and the figures feel plenty durable. The paint is simple, but effective, and lends itself to the retro style that I think Mondo is going for with these figures. That said, I would love to see some more elaborately painted figures, as there’s just enough detail present in the sculpts to have some fun! The doll eyes also add some great depth and character to the figures. As a bonus, Mondo threw in a one-off Galaxy People launch bonus, a very cool silver Asterian Parasitoid! This guy has a slightly more detailed sculpt, and the one-off has a really cool purple undertone effect and some very subtle sprays going on. I couldn’t help but play with these guys a little bit when I got them… having the two matching (I assume) good guys and a monster-type guy makes for some good battles. « Max Toy Co Mini Drazoran!